Xplor Park lets you explore the wonders of the Mayan Riviera in an exciting and adventurous way. The Park has everything that you need to satisfy your hunger for adventure. • There are 9 zipline circuits that allow you to discover the Mayan forest and get a bird’s eye view of the jungle. • Explore a Stalactite River with amazing stalagmite formation, and swim through the crystal clear waters of the underground rivers. • Ride the amphibious vehicles to discover jungle trails, caves, and grottos caves. Discover the mysterious jungles of the Riviera Maya as you drive a 4×4 buggy. 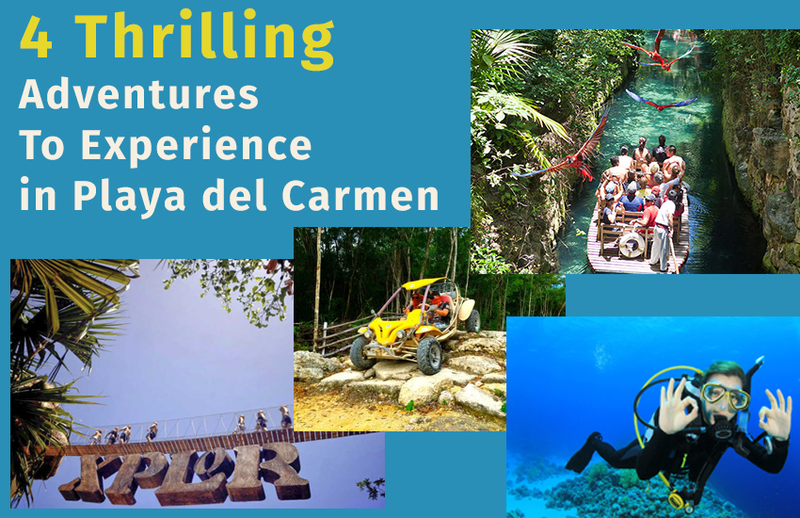 This tour is just 10 minutes from downtown Playa del Carmen. A professional guide will accompany you on your buggy tour and help you discover the local fauna and flora as well as the hidden treasures of the subtropical forest. • You will drive through the Mexican jungle for 18 miles and discover some amazing things typical to the area. • During your amazing buggy adventure, enjoy a refreshing break in the beautiful cenote by snorkeling and diving its clear waters. • You will also visit a typical village inside the Mayan jungle where you'll get to know what life is like for Mayan families. Xcaret Park tour is a perfect blend of nature, adventure, and culture. For excitement and thrilling experience, take part in this themed park tour and enjoy adventurous activities in a natural paradise like no other. This tour is an opportunity not be missed! • Explore the crystal clear waters of a cenote that features amazing rock formations and discover a river that goes through the Mayan village. • Snorkel and relax in the cenote of exquisite natural beauty. Scuba in the nearby reefs, or swim with dolphins. • The park also has a bird pavilion, butterfly pavilion, orchids and bromeliad greenhouse. • Discover the trails of the Mexican Cemetery in Xcaret and the traditional venue of the Hacienda Henequenera. • Witness a panoramic view of Xcaret Park by climbing the Rotating Scenic Tower. This is truly a memorable sight! Scuba Diving Adventures – Simply Amazing! The warm waters of Playa del Carmen with a huge variety of marine life make it perfect for scuba diving. You can expect to find all kinds of exotic sea life while diving in the clear waters of Playa. • You may find varied marine species including sea turtles, rays, nurse sharks, moray eels, giant groupers, green and caguama turtles, and huge schools of tropical fish. • Get to explore advanced cenotes such as Pit, Dream Gate, Angelita, Calavera or Temple of Doom, located south of Playa, for a once-in-a-lifetime cenote cavern diving experience. • Dive with bull sharks, experience and discover these remarkable creatures. Get ready for a magical encounter with the whale sharks while snorkeling the waters of Playa. Playa del Carmen is a great place that perfectly mixes bohemian, cosmopolitan and cool vibe with nature, adventure, and culture. Well, if you’re one who enjoys the beauty of nature and looking for adventuresome activities, then a boat rental Playa del Carmen vacation in Riviera Maya is an ideal escape for you.